Add fruit purees to baked goods in place of some of the fat. You can replace up to 30 percent of the fat in most recipes. Reduce the amount of sugar in baked recipes. You can usually reduce the sugar by 1/3 to 1/2 without sacrificing the quality of the recipe. Substitute dark chocolate for milk or white chocolate. Dark chocolate is a healthy food that fits into the clean eating plan. Look for dark chocolate with at least 70 percent cacao content. Look for baked whole-grain chips and dippers rather than the fried or processed varieties. Make your own pita chips by cutting pita breads into wedges and baking them until crisp. Choose dessert recipes with lots of fruit in them. A mixed fruit salad topped with one of the nut mixtures in this chapter makes a great dessert, especially if you add a little honey and lemon juice to the fruit. Poached fruit is also a great snack or dessert. Preheat the oven to 375 degrees F. Put the hazelnuts on a rimmed baking sheet. Roast the nuts in the oven for 8 to 10 minutes or until they’re slightly darker. Immediately put the nuts on a kitchen towel, wrap, and rub between your hands to remove about half of the skins. Let the nuts cool. 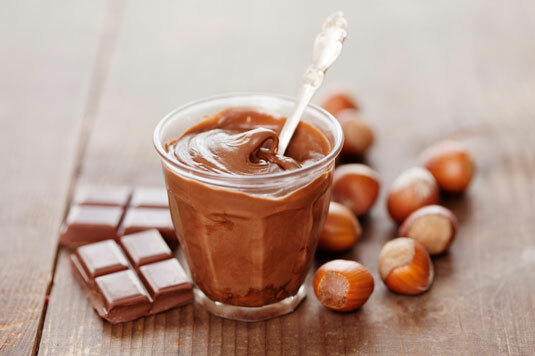 Put the cooled nuts in a food processor along with the cashews, melted butter or hazelnut oil, honey, vanilla, cocoa powder, coconut sugar, and hazelnut milk, and process until mostly smooth. Put the chocolate into a microwave-safe bowl and microwave on high for 30 seconds. Remove from the microwave and stir. Continue microwaving on high in 30-second intervals, stirring after each interval, until the chocolate is completely melted and smooth. With the food processor motor running, pour the warm chocolate through the feed tube and process until the mixture is as smooth as possible. Transfer the mixture to a resealable container and refrigerate. PER SERVING: Calories 206 (From Fat 132); Fat 15g (Saturated 5g); Cholesterol 3mg; Sodium 15mg; Carbohydrate 17g (Dietary Fiber 3g); Protein 3g.